Alberta Ski Resorts Open For Business! 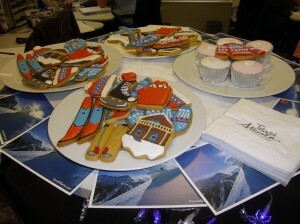 We celebrated the official opening of Lake Louise & Sunshine Village ski areas today, with coffees, cakes and ski themed gingerbread biscuits in the Ski Independence office. Thanks must go to Travel Alberta who very kindly provided all the treats, and here are a few photos of what was consumed this morning to fuel our day of work in the office!